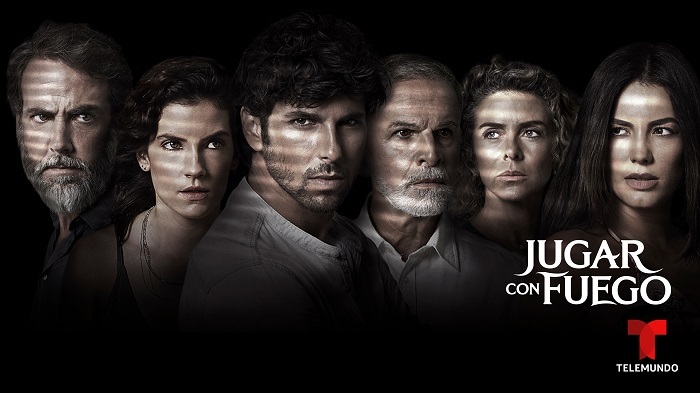 The premiere of Telemundo's new captivating thriller Jugar con Fuego (Playing with Fire), produced by Telemundo International Studios and Globo, ranked as the # 1 program on Spanish-language television at 9 p.m., among adults 18-49 and adults 18-34, according to Nielsen. Starring Jason Day, Carlos Ponce, Margarita Rosa de Francisco, Gaby Espino, Laura Perico, Tony Plana and Marcelo Serrado, the premiere of the 10-episode series averaged 615,000 adults 18-49 and 256,000 adults 18-34, outperforming Univision's Mi Marido tiene más Familia in both demos, and ranking as the #1 most social program among Hispanic networks in primetime. Locally,Jugar con Fuego's premiere ranked as the #1 program, regardless of language, among adults 18-49 in Houston and Miami in its timeslot. It also ranked as the #1 Spanish-language program in its timeslot in Los Angeles, New York, and Chicago among adults 18-49. Shot entirely on location in the Colombian coffee "triangle," Jugar con Fuego tells the story of Fabrizio, an attractive and charming young man, who bursts into the lives of three women, Camila and Martina, married women who are great friends - and Andrea, Martina’s daughter. His arrival from Mexico will disrupt, in a terrible and permanent way, the life of the homes in the prosperous Colombian coffee zone, and his incursion into a forbidden territory will confirm that playing with fire ... can bring terrible consequences. Source: Nielsen, 1/22/19, L+SD, Tue 9-10 p.m., A18-49(000). NSI, 1/22/19, Tue 9-10 p.m. EST & PAC/8-9 p.m. CEN, rank based on A18-49 (000). Nielsen Social Content Ratings, 1/22/19, ranked by total linear episode-level interactions.